Ravi Shanker has been a qualified physiotherapist for nearly a decade, amassing extensive experience in physiotherapy in NHS, Army Primary Health Care and private sector. Ravi has worked as a highly specialist musculoskeletal physiotherapist at BMI Clementine Churchill Hospital in London where he has worked closely with London's most renowned orthopaedic consultants. Ravi has also worked as a pitch side physiotherapist for London's elite sports clubs. Ravi is committed to continuing his professional development to provide most up to date and evidence based treatment techniques. He has successfully completed his Masters Degree in physiotherapy in 2007 from Sheffield Hallam University and then completed his Diploma in orthopaedic medicine from Middlesex University in 2009. 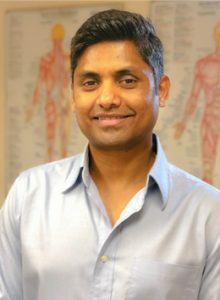 Ravi has strong hands on approach and provides wide range of patient specific treatment regime including manual therapy, muscle energy technique, myofacial release, and acupuncture. Ravi has got special interest in treating back pain and shoulder injuries.